The term “Internet of Things” means communication in many different facets: from the vehicle, into the vehicle, between the vehicle components, but also between vehicle components and the Internet. 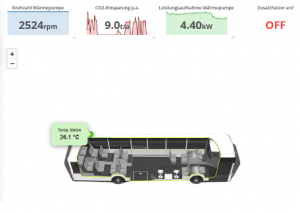 For example, the vehicle communicates with dynamic passenger information system at bus stops, components report necessary maintenance to the workshop or the performance of the individual systems in the bus is optimally coordinated with each other. An important factor of success is change of information and services of the systems. The compentence and systems of Fraunhofer IVI offers this interoperabiliy, in which the systems collaborate in an efficient way. The comprehensive IoT total solution offers the possibility to all vehicle components to transmit comprehensive data to the cloud via an uniform interface. At vehicles side a telementry unit, equipped with a SIM card, is installed, that takes information out of on-board communications network, filter them and transmit them in a compressed and safe way. At cloud side a great varity of analysing methods and analysing representation can be choosen. With the assistance of the components manufacturers early failures, not optimal operating adjustments or misfunctions can be recognized and fixed in a cost-saving way. Furthermore the system can evaluate the interaction by combining information of different components and therefore examine, simulate and back-up efficiency-enhancing measures without labourious troubleshooting. Especially breakdown, maintenance intervals and service work can be avoided. Always up-do-date information on vehicle, energy supply and service work are at the operators disposal.